With the track in place, I was keen to test it. Wiring up the point motor is quite easy. 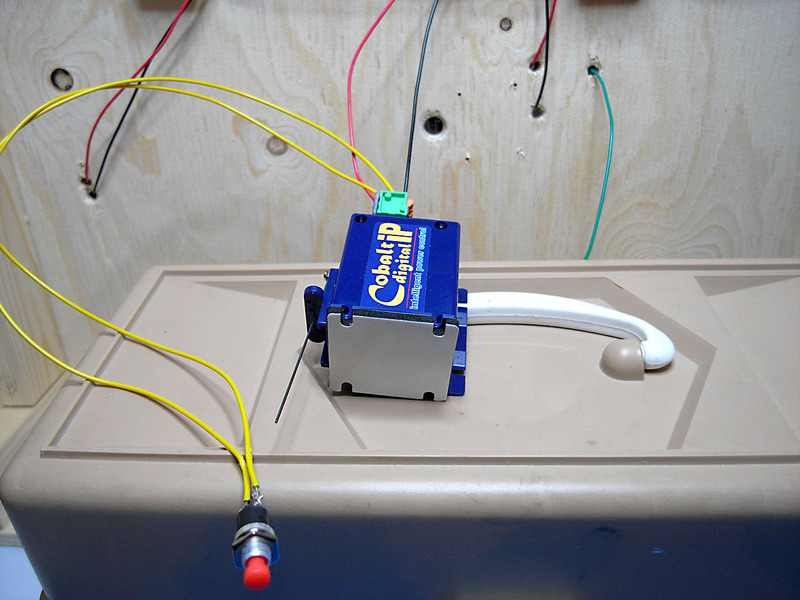 Cobalt point motors can be powered from the DCC power supply used to power the track. All I had to do was run two wires (black and red) from the power bus to the point motor. I soldered the wires to the power bus and connected them to the spring loaded terminals on the point motor. You can use DCC commands to change the point, however I like control panels with switches to control points. (Call me old fashioned…) Cobalt provide built in terminals for ‘manual’ point operation. I connected two wires (yellow) to a ‘push to make’ switch and connected these to the terminals on the motor. I decided to remove the point motor from the baseboard and test to see whether it worked. As you can see from the video, it worked well. I mounted the point motor back on the baseboard and completed the wiring. To power the frog I connected the wire from the frog (green) to the purpose built spring loaded terminal on the point. That was easy. Finally, to power the track in the head shunt, I soldered the dropper wires from the headshunt to the DCC power bus. Now for a real test with a loco! Again, I’m really pleased to say it worked! I am definitely no electrician, I’ve never used Cobalt point motors or DCC before, and everything worked first go.